This week we have friends visiting from the Pacific Northwest - perfect time to create a fun dining room fall beach themed tablescape to entertain our friends. Putting a few ideas together throughout this month. At the end of the October, we will reveal our actual table! Beautifully elegant with easy elements from your local beach and grocery store! Keep it neutral, clean and "sea washed" for something really spectacular. 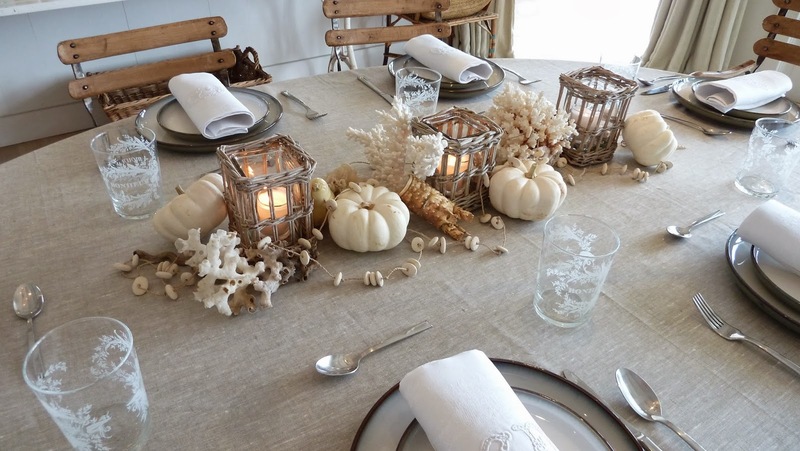 Using a natural linen backdrop with white linen napkins; add driftwood, white shells or coral, white pumpkins and natural rattan or wicker candle lanterns and you've created a beautiful relaxing sand and shore table.